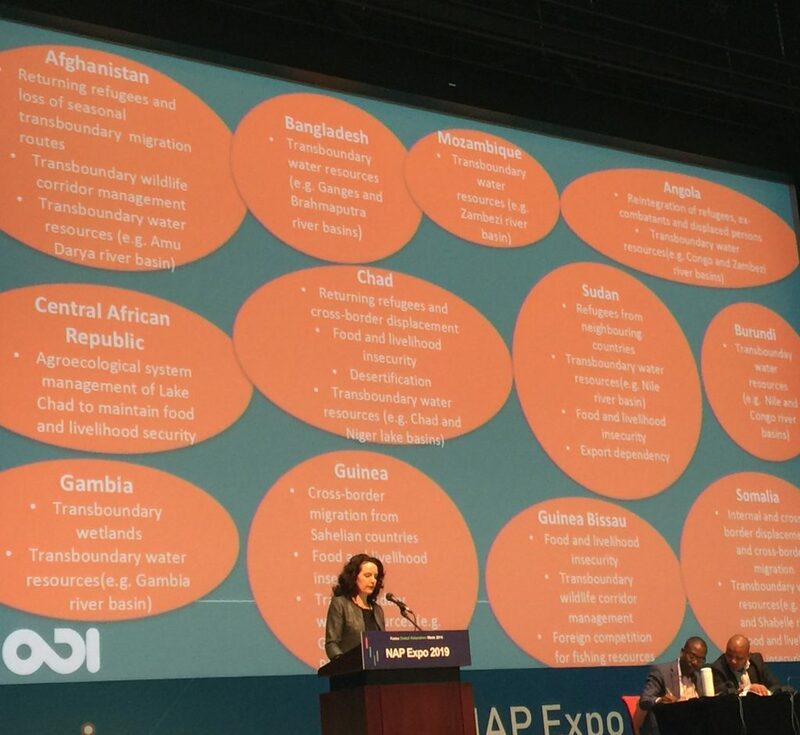 The third day of the NAP Expo addressed adaptation in key sectors and systems with a focus on agriculture, fisheries, water, coastal zones and mountain systems. 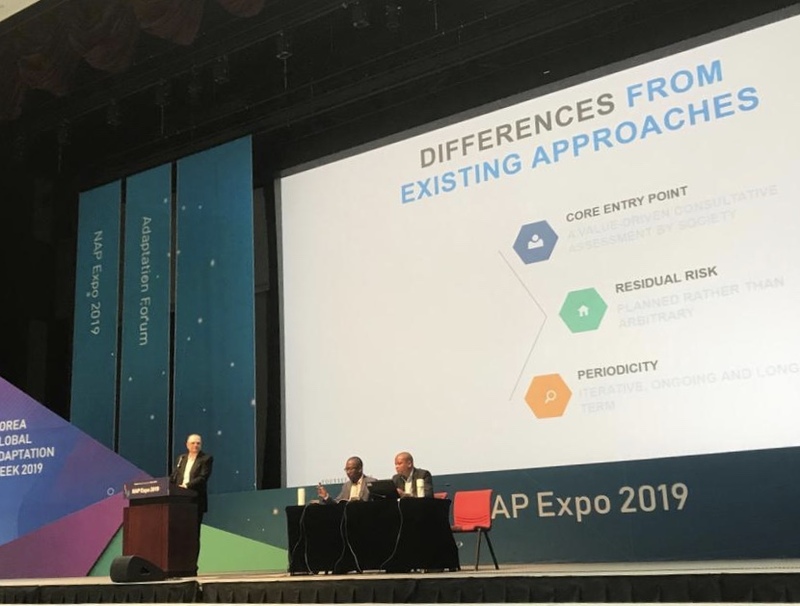 It featured the last set of its keynotes on the resilience continuum, key messages from the Hindu Kush Himalaya Assessment, transboundary climate risk and Korea’s experience on adaptation and lessons learned to inspire the day’s events. The day also contained discussions on climate data and assessments and the ongoing stream of work on Open NAPs. The day also featured this year’s Adaptation Forum which is one of the four events taking place this week. At the end of the day the LEG also convened a stocktaking meeting with all contributing organizations. Dr. Youssef Nassef, Director of Adaptation at the UNFCCC secretariat kickstarted the day with a keynote on a systematic approach to climate change adaptation that makes a case for the optimization of action across the three main response clusters: preemptive adaptation (P) or risk reduction including by way of National Adaptation Plans (NAPs); contingent arrangements (C) such as insurance and various financial instruments; and loss acceptance (L) where most appropriate. The response clusters do not have a predetermined hierarchy across them and are informed by loss tolerability consistent with societal values and cost effectiveness. The framework provides a departure from current hierarchical practices that deem preemptive action to be the most desirable type of response, followed by contingent action, followed by humanitarian or similar interventions to address whatever losses are left over from the climate impacts under consideration. Dr. Dhrupad Choudhury of the International Centre for Integrated Mountain Development (ICIMOD) provided key messages from the Hindu Kush Himalaya Assessment Report released by ICIMOD in February 2019. These included warmer days and nights and significant changes in precipitation extremes in past decades. These changes are resulting in significant impacts on agriculture and food production affecting the 240 million in the HKH that directly depend on it. Furthermore, the entire population of the HKH is at increased risk of natural hazards such as floods, landslides, avalanches, droughts and earthquakes. The assessment further stresses that even an average global temperature of 1.5 degrees Celsius is too hot for the Himalayas. The assessment stresses the urgency for adaptation in the HKH including through national and regional adaptation plans. It provides three priorities for action which are: concerted action is urgently needed to keep global level climate change to 1.5 degrees by 2100; recognizing and prioritizing the uniqueness of the HKH mountain people; and cooperate at all levels across the HKH region for sustainable and mutual benefits. Dr. Rebecca Nadin, head of Resilience Programme at the Overseas Development Institute, made a keynote on understanding and managing transboundary climate risks. Transboundary climate risks constitute a category of risks that cross national borders and affect all countries, irrespective of their level of development, wealth or power. Such risks may include changing migration patterns driven by climate change, changes in shared resources such as water and other biophysical systems, regional and global supply and value chains, and finance. Evidenced examples of transboundary impacts include the global food price crises in 2008 and 2011 owing to widespread droughts, and the economic shocks from the 2011 Bangkok floods. There are existing transboundary programmes such as the Great Green Wall for the Sahara and Sahel Initiative and the Africa Adaptation Initiative. 34 LDCs made reference to transboundary risks in their NAPAs . There is a need to strengthen the consideration of transboundary needs in the NAPs, and exchange of strategies and draft NAPs between neighboring countries can create opportunities for co-development of transboundary adaptation solutions. Dr. Heun Jin Oh, Director of Climate Change Adaptation division at the Ministry of Environment made a keynote on Korea’s climate change adaptation experience. Korea climate change master plan contains adaptation at all levels of government, guided by a national adaptation plan and action plans for central governments, metropolitan governments and municipal governments. Korea published its first NAP in 2010 and the second one in 2015. Many local governments have developed, or established adaptation plans as a pilot phase. The legal foundation of Korea’s NAP is the Framework Act on Low Carbon Green Growth of 2010. Local adaptation plans a guided by the Enforcement Decree of Framework Act on low Carbon Green Growth. The national climate change master plan includes support for key public corporations, organizations managing infrastructure, and private sector companies. The Korea Adaptation Center for Climate Change (KACCC) is the designated organization for adaptation. Korea will develop its 3rd NAP in 2020. Two productive sessions as part of the Open NAP series were successfully delivered today. In the morning, representatives of countries where Open NAPs were applied shared results and lessons learned from the application of the workout. The Philippines, as one of the countries that have earlier embraced the integrative framework assessment for NAP and SDGs in its work in updating its National Climate Change Action Plan (NCCAP) with an aim towards producing a NAP, emphasized the benefits in using systems approach in further identifying the synergies and trade-offs of the seven thematic priorities identified in the NCCAP. A comprehensive mapping of the country’s master plans for different sectors was also undertaken as part of the exercise to ensure that development priorities and climate change adaptation priorities speak to each other. Other countries such as Sierra Leone, South Sudan and Malawi which are in the earlier stage of applying the Open NAP initiative noted that they have seen the potential of the initiative and the application of the NAP-SDG iFrame as a methodology to assist in managing the various ongoing support and initiatives for adaptation and compile and package into a NAP which serve as the central vehicle for adaptation planning and implementation. As a continuation of the writing workshop launched yesterday, the LEG and the senior scientists presented a draft outline of the NAP book and list of keywords of topics that individual case studies could address where possible. The outline fully encapsulates the key elements of the NAPs at the same time responds to the key areas of the IPCC AR6. Representatives of countries indicated their interest to be contributors of the book. The LEG emphasized that expression of interest should be done via the focal point. The writing group agreed on a November 2019 target to finish the book. 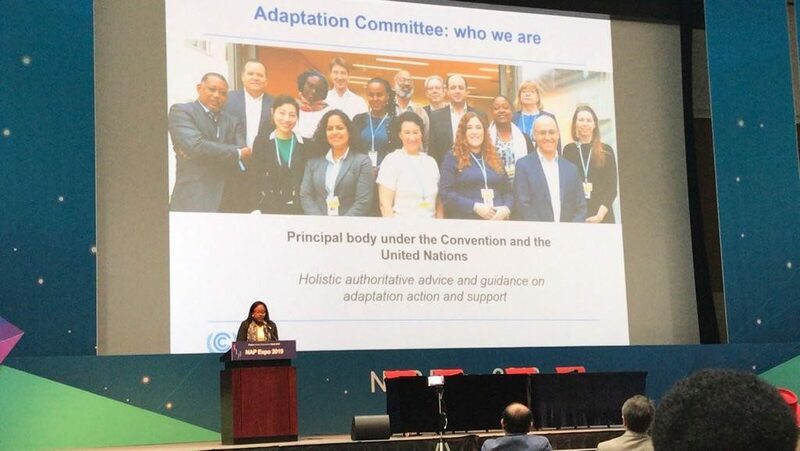 Countries have acknowledged that there is a need to move away from traditional adaptation planning that does not consider the future implications of a suggested transformational pathway. While this is the case, most governments are still faced with a myriad of issues to consider, including, culture, gender, participation, financial, social, and others. The leadership of governments to enhance transformational agriculture is essential for adaptation in this sector. The Addressing agriculture, forestry and fisheries in National Adaptation Plans – Supplementary guidelines (or the NAP-Ag Guidelines) are an important resource in ensuring that country NAPs address the long-term challenges of climate change on agricultural systems. For transformational agriculture to succeed issues such as capacity building of extension workers has to the prioritised, as these play a critical role for most subsistence farmers who are usually the majority. Equipping them with the latest skills will promote access to quality services with the agriculture sector. Transformational agriculture will need to tap into the skills and capacities that exist within other sectors to support farmers in developing countries build resilience against the current and future impacts associated with climate change. Water is the common thread connecting global and national ambitions and commitments; NDCs, NAPs SDGs, the Sendai Framework for Disaster Risk Reduction and national development plans. Adaptation in water is crucial for strengthening the resilience of economies, livelihoods and natural ecosystems by reducing water related vulnerabilities and building adaptive and transformative capacities. The economic cost of inaction to adaptation of climate change impacts on water could be high and governments should protect their development goals and ambitions from being derailed by climate change by investing in water governance. A risk-based approach is essential to define responses and success depends on stakeholder ownership. A well-argued economic case for water helps ensure buy-in from decision makers. Communications around these economic arguments must address real-world problems, advocate practical solutions and persuade stakeholders. Regional and transboundary dimensions of shared waters calls for an integrated approach transcending national boundaries. It is similarly important to build embedded in-country knowledge and capacity, as well as strengthen data and information systems. A comprehensive scientific assessment carried out in the Hindu Kush Himalaya region emphasized the perspective that mountainous regions are considered as very sensitive regions with regard to global warming and the worldwide observed intensifying climate variability. It is very likely that climate change has particularly fast and direct consequences on the frequency and intensity of natural hazards occurring in these regions. The session fostered an interactive forum on NAPs for mountain countries to share experience, best practices and lessons learned, including discussions on how to advance the acceleration of progress towards successful formulation of NAPs, and their effective implementation within mountain countries. The deliberations highlighted the goods and services that mountain areas provide to the often densely populated downstream areas. This also emphasized the strong dependency that the lower riparian areas have on the mountain systems (Highland-Lowland interactive systems) and therefore the need for significant targeted investment in adaptation initiatives in mountain areas. Aquatic systems that sustain fisheries and aquaculture are undergoing significant changes as a result of global warming and projections indicate that these changes will be accentuated in the future. Temperature of water bodies is increasing across the globe, which results in more pronounced stratification of the water column, with more dramatic consequences for freshwater systems than for oceans because of their shallowness and lower buffering capacity. Thermal influences through climate change affects the fisheries. This has contributed to reduced exchange between deep, nutrient-rich water and surface waters thus reducing primary production which ultimately reduced fisheries production. Primary production in the oceans has been projected to decrease. There is a need to further explore ideas and options for advancing understanding of the future of tuna fisheries, and how nations that reply on tuna economically can factor in associated risks in their planning. Furthermore, it should address emerging science gaps, along with ideas for regional to global cooperation in improving our understanding the future dynamic of tuna fisheries under climate change. 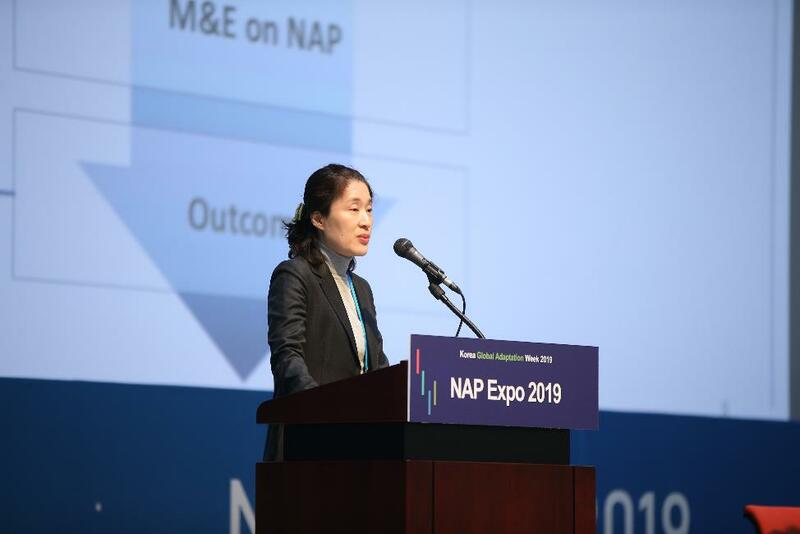 Participants at the NAP Expo 2019 were introduced to participatory modelling approach, which could serve as basis and a useful method for the co-development of a process to formulate and implement National Adaptation Plans with stakeholders. 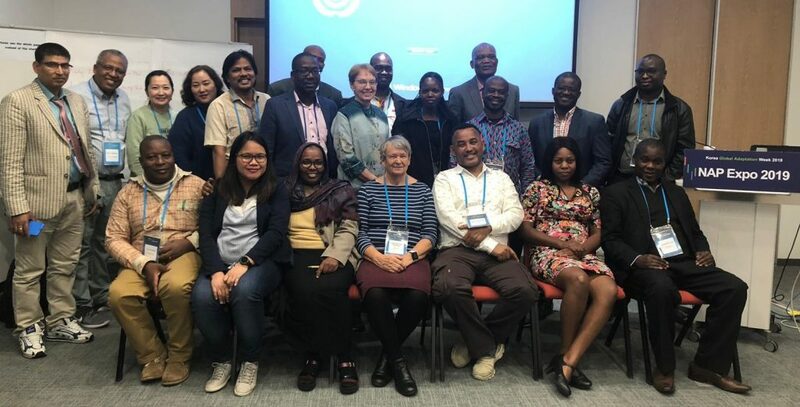 The modelling approach, developed by the Climate Service Center Germany (GERICS), provided entry points to engage with stakeholders, to co-design and to co-develop within the NAP process using a science-based systemic approach. Mediated modeling using systems dynamics engages stakeholders in the modelling by integrating their perception and perspective on the NAP process considering the four elements (A) Lay the groundwork and address gaps (B) Preparatory elements to identify vulnerabilities and risks (C) Implementation strategies and (D) Reporting, monitoring and review. Demonstration of the open-source economics of climate adaptation assessment model CLIMADA, showed how hazard, exposure and vulnerability is integrated to compute the necessary metrics to assess risk and to quantify socio-economic impact. The model, which uses state of the art probabilistic modeling, showed much potential for conducting the risk analysis and the adaptation option appraisal part of and Economics of Climate Adaptation study. The open source nature allows users to modify the model and add functionalities to the users’ very diverse needs and (geographic) risk and adaptation contexts, e.g., for agricultural or health-related impacts. It is recognized that “open source” means the core code comes for free, but resources and efforts need to be spend by the users, drawing on local experts, local data and tailoring it to their exact needs. The method and the model would be interesting for NAP planning to a range of participants; the low cost compared to established consultancies / insurance companies running such analyses is very attractive. Climate rational provides scientific evidence for investment and decision making. It provides the scientific underpinning for evidence-based climate action decision making and the theory of change of all activities funded by the Green Climate Fund (GCF). It explains what to invest in and explains the trade-offs to be made. It is an essential paradigm shift in doing investment. The methodology is founded on three over-arching scientific topics that are used for describing past present and future climate, these are: headline climate indicators, sector specific indices and high impact events. Figure 1. 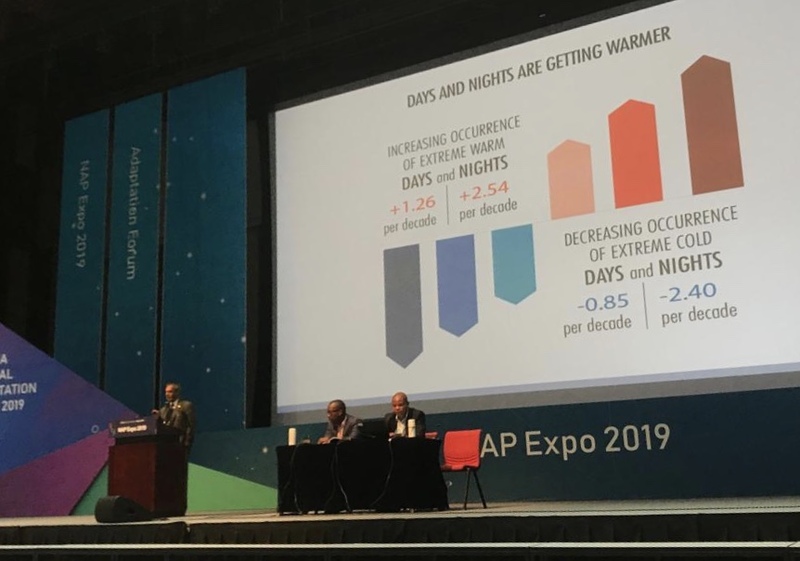 Enhancing the climate science basis of the climate rationale in GCF funded activities partnership, presentation by Amir H. Delju, WMO Climate Prediction and Adaptation Branch, at the NAP Expo, 10 April 2019. To support Climate Rationale, every year, WMO issues a Statement on the State of the Global Climate based on data provided by National Meteorological and Hydrological Services (NMHSs) and other national and international organizations. There is a need to move from the use of casual links to climate change to the use of hard reliable scientific data for decision making. Tools have been developed by researchers to support decision makers turn their climate data into useful decision making information. ClimPACT2 is a software package that calculates the climate indices for sector specific applications as well as additional climate extremes indices. Countries can also use tools such as Climdex to help understand patterns in temperature and precipitation extremes: how they change from year to year or from place to place. Tools such as Climate Data Access and Analysis System (CDAAS), which is a one stop portal for accessing, analysing and visualizing Global Climate Model outputs are readily available for supporting decision makers with processed climate information. Countries are encouraged to share their data with global databases to support easy access to climate data.